The message was loud and clear. 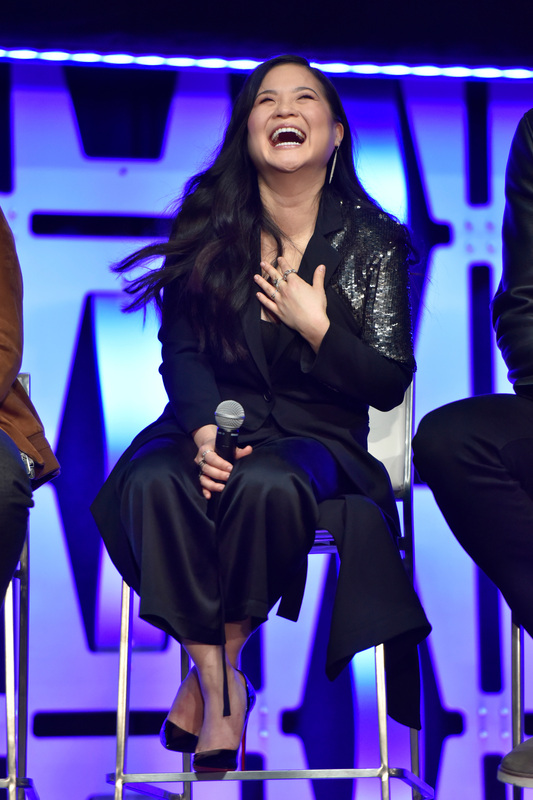 Upon her official introduction during this year’s most-anticipated Star Wars Celebration Panel, the first-ever look at “Star Wars: The Rise of Skywalker,” the loudest cheers were for a relative newbie to the franchise: Kelly Marie Tran. The actress, who made her “Star Wars” debut in Rian Johnson’s “Star Wars: The Last Jedi,” teared up when the thousands of fans assembled at Chicago’s Wintrust Arena greeted her with uproarious applause and cheers. Tran’s emotion was understandable. After breaking out as the first woman of color to have a lead role in a “Star Wars” film, the actress became the victim of vicious online trolling (supposedly from “fans” of the franchise) regarding her looks, ethnicity, and talent. Tran has endured months of harassment, both on social media (including her own Instagram account) and in rancid comment threads on posts about the film and her work in it. In June 2018, Tran wiped her own social media accounts. The actress had lots of support from some big names: Co-stars like John Boyega and Mark Hamill defended the actress, and cos-players organized a #RallyForRose at Comic-Con 2018, but amidst a seemingly never-ending war against both Tran and director Johnson, it was hard to shake how toxic, ugly, and loud her detractors were. And, of course, they all claimed to be fans of the franchise. And yet Tran has emerged from the scrum, and perhaps so has actual Star Wars fandom. In August, Tran wrote an emotional op-ed for The New York Times about her experience, ending on a positive call for action. “I want to live in a world where people of all races, religions, socioeconomic classes, sexual orientations, gender identities and abilities are seen as what they have always been: human beings,” she wrote at the time. Later that afternoon, Tran received yet another raucous welcome when she stopped by the “Star Wars Show Live,” and fans swarmed around the centrally located stage, set in the middle of a packed exhibition hall floor. The warm reception Tran received seemed emblematic of this year’s Star Wars Celebration as a whole. While “Star Wars” has long included complex and interesting female characters — from Princess Leia to Queen Amidala, Rey, and Jyn Erso — they’ve never been the majority. That changed with Johnson’s film, which introduced Tran’s Rose Tico, along with her badass pilot sister Paige (Veronica Ngo), and the legendary Vice Admiral Amilyn Holdo (Laura Dern), and included returning roles for Gwendoline Christie’s Captain Phasma, Billie Lourd’s Lieutenant Connix, Hermione Corfield’s Tallie Lintra, and Lupita Nyong’o’s Maz Kanata. And that’s to say nothing of stars Daisy Ridley and Fisher, who remain essential parts of the third trilogy. Upcoming entries in the expanding Star Wars franchise also have compelling new parts for women: “The Rise of Skywalker” panel also introduced “Lady MacBeth” star Naomi Ackie as an all-new character named Jannah (rumored to be the daughter of Lando Calrissian) who promises a “wicked” run-in with the rest of the film’s beloved characters, while Gina Carano will star in TV series “The Mandalorian” as a former Shock Trooper dealing with the aftermath of a terrible war. They’re joining a franchise filled with women, and the fandom is evolving to reflect that change. That’s never more obvious than when pushing through the hustle and bustle of Star Wars Celebration. The semi-annual fan festival and convention has long offered a inclusive atmosphere for Star Wars devotees — having covered three of these events in the past four years, this writer can attest to SWC attendees being the most cheerful and accepting convention-goers, always eager to offer a costuming compliment or directions to a hidden part of the convention floor — and that seemed especially clear this year. While the convention floor was packed with female attendees and plenty of cosplayers, from Reys and Leias to a number of impressive Admiral Holdos and Captain Phasmas, scores of Ahsoka Tanos and Hera Syndullas, and at least one incredibly detailed porg, attention was also paid to female fans through Celebration’s panel programming. On Friday afternoon, female fans gathered to discuss the unique challenges of cosplaying as a woman, including how to build out their costumes. Two hours later, much of the same crowd made their way to a live taping of the “Star Wars Geek Girl” podcast, where popular hosts Lizzy Perales and Zoe Hinton used their life-long love of the franchise (and their whipsmart teen comedy) to get fans excited for the rest of the event. While more sparsely attended than the morning panels, the panel hosted a mixed crowd, as both men and women showed up to watch host (and voice of beloved “Clone Wars” and “Rebels” animated character Ahsoka Tano) Ashley Eckstein chat with a number of women from different corners of the Star Wars galaxy. Among her guests: fellow voice actors Vanessa Marshall, Suzie McGrath, and Catherine Taber, along with fan-turned-official-author Amy Ratcliffe and producer Athena Portillo. Before the panel kicked off, however, all female cosplayers were invited on to the stage to show off their costumes. By the time they stopped showing up, the stage was almost full. It was overwhelming. For Eckstein, who also created the female-targeted geek fashion line Her Universe, the panel spoke to the heart of her continued rallying cry. “‘Star Wars’ is for everyone, … not just men and boys, not just women and girls,” she told the crowd. “It’s something we should all enjoy together.” Looking around the audience, it seemed like her wish had already come true.